The Impulse 7000DP defibrillator AED analyzer ensures proper operation and ultimate performance of critical life-support cardiac-resuscitation equipment, including mono- and bi-phasic defibrillators and AEDs. This best-in-class defibrillator analyzer offers test capabilities that encompass a global spectrum of established pulse shapes, feature breakthrough AED technology compatibility, and deliver superior performance with accuracy readings ± 1% of reading +0.1J. The Impulse 7000DP model is a combination Defibrillator/Transcutaneous Pacemaker Analyzer with an intuitive user interface, backlight, and easy-to-read display. This portable, rugged, easy-to-carry device features functionality that includes energy output measurement, ECG waves, and an extensive range of test loads and measurement algorithms needed to test external transcutaneous pacemakers. The Impulse 7000DP coupled with the Impulse 7010 Defibrillator Selectable Load Accessory enables end-users to select from multiple loads (25Ω - 200Ω) ensuring IEC 60601-2-4 compliance. The Impulse 7000DP features 10 independent ECG outputs that provide 12 lead combinations for standardized clinical signals. FBC-IMP7000-8010 defib plate (part# 3156262) *Each unit requires two. After charging my unit completely (until the Charge Status LED turns green), the battery charge level still indicates less than 100 %. What's wrong? How do I get the charge level to read 100 %? The answer to this question is somewhat counterintuitive. Battery pack gas-gauge ICs, such as the one used in the Impulse 6000D/7000DP, use a complex algorithm to estimate battery-charge state, taking into account time, temperature, and current flow. The self-discharge estimation (i.e., how much charge the battery loses over time during periods of non-use, sometimes called "shelf-life") is particularly sensitive to battery chemistry, and the shelf-life of today's NiMH cells is significantly longer than the algorithm built into the gas-gauge ICs can accommodate. When an Impulse 6000D/7000DP is left idle for a few weeks and then powered-on, the battery charge level might be reported as 55 % when the true charge level might be 80 %. If the battery is then completely charged, which requires a 20 % increase in battery charge level, the charge level is only reported as 75 % (55 % plus 20 %). To correct the reported charge level, use the "Train Battery" feature. To access this feature, press the [SETUP] key, then the [F1] softkey(labeled "Battery"), then press the [F3] softkey (labeled "Train Battery"), then follow the instructions presented on the screen. This procedure can take overnight to complete. To keep the reported battery charge level as accurate as possible during extended periods of non-use, the Impulse 6000D/7000DP should be left connected to mains power via the battery charger with the unit powered off in an ambient temperature of 15Â° C to 26Â° C (60Â° F to 78Â° F). This will continuously trickle-charge the battery (the charge-status LED on the rear panel will be green) to keep both the actual and estimated battery charge level at 100 %. Are all biphasic waveforms alike? No. Different waveforms perform differently depending on their shape, duration, voltage, current, and response to impedance. Different biphasic waveforms are designed to work at different energies. Impulse 6000D/7000DP measures the monophasic waveforms used in the legacy defibrillators, biphasic waveforms used in current technology, as well as pulsed-biphasic waveforms, an emerging technology. Can I always count on getting nine hours of continuous battery operation on a fully-charged battery? Age of battery pack. The battery pack will lose some charge capacity over time. Use of the backlight display function. This option discharges the battery pack faster. 3. Operating the unit at the upper end of the specified operating temperature range, causing the internal fan to power on more often. This may especially be observed with multiple, rapid, high-energy defibrillator pulse discharges into the unit. Can I operate or charge my Impulse 6000D/7000DP from a 12 V vehicle battery using an AC inverter to power the charger that came with my Impulse 6000D/7000DP unit? No. For safe and reliable operation, the battery charger MUST have a good earth ground when connected to the Impulse 6000D/7000DP, and vehicle electrical systems inherently lack an earth ground. For battery charging only (with the Impulse 6000D/7000DP turned off, and no other connections to the Impulse 6000D/7000DP unit other than at the charger input jack), using a DC-to-AC inverter to power the battery charger may yield consistent battery charging, depending on the quality of the inverter used. As of this writing, Fluke Biomedical cannot recommend the use of a DC-to-AC inverter for battery-charging-only use with the Impulse 6000D/7000DP. No. Replacement of the battery pack in the Impulse 6000D/7000DP requires disassembly of the unit. Impulse 6000D/7000DP owners who send their units to a Fluke Biomedical Authorized Service Center for periodic calibration may want to consider requesting replacement of the battery pack as preventative maintenance, which can be performed for a nominal charge. Can I use a different battery charger than the one supplied with the unit? No. For safe and reliable operation, the battery charger supplied with the Impulse 6000D/7000DP MUST be used when operating from mains power, or when operating and charging the battery at the same time. Does Impulse 7000DP test both transcutaneous and transvenous pacers? Impulse 7000DP tests the full function of transcutaneous pacers, but not transvenous pacers. For transvenous pacer testing, try the SigmaPace 1000 or DALE400 analyzers. Does the condition of the battery affect the calibration/specifications of the unit? No. The Impulse 6000D/7000DP was designed and tested to meet all its performance specifications at any battery-charge level when operating from mains power or when operating from mains power while charging the battery. 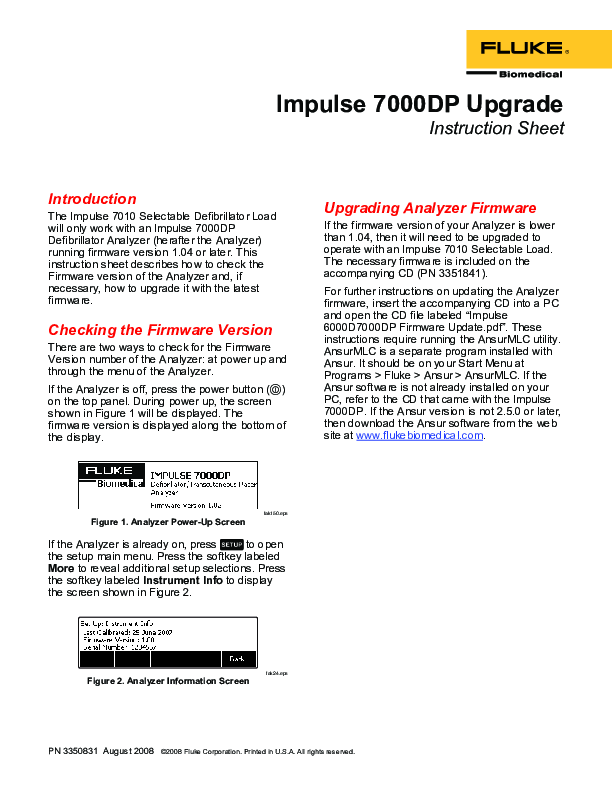 Does the Impulse 7010 work with other defibrillator analyzers other than Impulse 7000DP? The Impulse 7010 only works with Fluke Biomedical's newest defibrillator/external pacer analyzer, the Impulse 7000DP. It will not function with legacy Fluke Biomedical analyzers such as Impulse 4000, QED6, QA40/45, or with competitor products. How can I properly test internal paddles used with defibrillators in surgery? Should I use conductive gel? Testing defibrillator energy delivery using internal paddle electrodes, which typically have a curved shape unlike external paddles whose electrodes are flat, is best done using the special internal discharge paddle contacts accessory. Do not use conductive gel when testing internal discharge defibs; the same applies to external discharge adhesive electrodes. The conductive electrolytic gel is only used on patients to improve the contact to the external paddles. The analyzer has very low-resistance contacts that do not require gel. Clinically, the non-sterile conductive gel is never used inside the patient's thoracic cavity during open heart procedures with the internal discharge paddles. The internal discharge paddle adapters for the Impulse 7000 can be eTO2 gas sterilized and used on sterilized internal discharge paddles, but non-sterile adapters may be used on non-sterilized internal discharge paddles as a pre-test prior to the sterilization process of the paddles. IMPORTANT These adapters can not be steam sterilized, as it creates too much heat for the plastic parts. Plug the battery charger accessory included with your analyzer into the charger input on the rear panel and plug the mains cord into the charger unit and into mains power. The charge-status LED, visible from the rear panel, will glow red to indicate the battery is charging. The LED will turn green when charging is complete. A full recharge takes approximately four hours or less. How does the Ansur test automation plug-in work? Ansur test automation systems allow a solution-based approach to complete testing of the medical device under test. Ansur helps you create standard work using the test template/sequence (which is based on your written test procedure) and integrates all test results into a single test report that can be printed or digitally archived. Ansur manages test procedures by allowing both manual and visual automated test sequences. Ansur also comes with generic test procedures so you can begin automated testing immediately. I own another Fluke product that came with a 12 V automotive ("cigarette lighter") adapter that fits the DC input jack on my Impulse 6000D/7000DP. Can I use this adapter to operate or charge the Impulse 6000D/7000DP from a 12 V vehicle battery? No. For safe and reliable operation, the battery charger MUST have a good earth ground when connected to the Impulse 6000D/7000DP, and vehicle electrical systems inherently lack an earth ground. For battery charging only (with the Impulse 6000D/7000DP turned off, and no other connections to the Impulse 6000D/7000DP unit other than at the charger input jack), attempting to charge from a 12 V vehicle gives inconsistent results and therefore cannot be recommended. Is it OK to leave my Impulse 6000D/7000DP unit connected to the battery charger when not in use? Yes. Actually, to keep the reported battery charge level as accurate as possible during extended periods of non-use, it is recommend that the Impulse 6000D/7000DP be left connected to mains power via the battery charger with the unit powered off, in an ambient temperature of 15Â° C to 26Â° C (60Â° F to 78Â° F). This will continuously trickle-charge the battery (the charge-status LED on the rear panel will be green) to keep both the actual and estimated battery charge level at 100 %. If the Impulse 6000D/7000DP cannot be kept connected to the battery charger during periods of non-use, the battery should be charged at least once a month. A unit with a discharged battery that is stored for an extended period of time will result in the battery becoming over-discharged, which is likely to result in permanent damage to the battery. On the "Set Up: Battery" screen, the battery charge level remains at "Power = 50 %" even after charging the battery for a few hours. What's wrong? On the Impulse 6000D/7000DP, the internal battery pack contains a gas-gauge IC that monitors the battery-charge level. This gas-gauge IC reports the charge level as one of sixteen levels, from 0 % to 100 %. The Impulse 6000D/7000DP reports the battery-charge level in 5 % steps, from 0 % to 100 %. Therefore, five of the 5 % steps aren't used (15 %, 35 %, 50 %, 70 %, and 90 %). The "Power = 50%" message is an indication that the microprocessor was unable to communicate with the battery pack. If this message persists, the battery pack is probably defective. Should I drain the battery completely before charging my Impulse 6000D/7000DP unit? This is not necessary. The battery does not exhibit a "memory effect". After multiple partial charge-discharge cycles, or if the unit is unused for an extended period of time without the charger active, the battery level indication may become inaccurate (i.e., out-of-sync with the actual battery charge level). Completely discharging the unit before charging it will resynchronize the battery charge level indication. The charge-status LED blinks red continuously. What does this mean? Also, the battery will not be charged if the battery voltage is too low, which can happen if the Impulse 6000/7000DP has been stored for an extended period of time with a fully-discharged battery. In the "Charge Pending" mode, the battery-charging circuit charges the battery at a low rate, which will eventually bring the battery voltage high enough for the normal charge cycle to begin. The charge-status LED on the rear panel does not glow red when I plug in the charger. What's wrong? If the Impulse 6000D/7000DP is turned on, make sure the "Charge Battery" setting is set to "Yes" on the "Set Up: Battery" screen (refer to the operating manual for details). If the Impulse 6000D/7000DP unit is turned off, the LED should glow red when the external charger is connected correctly and mains power is present. What does the Ansur plug-in do? When combined with the high-end functionality improvements of the Ansur test automation system, your Fluke Biomedical analyzer provides a solution-based approach to complete analysis of the medical device under test. Fluke Biomedical test equipment with Ansur automation solutions create standard work using test templates/sequences based on customer's written test procedures, manage test procedures by allowing both manual and visual automated test sequences, and integrates all test results into a single test report, which can be printed or archived. What is Impulse 7010, Defibrillator Selectable Load Accessory used for? 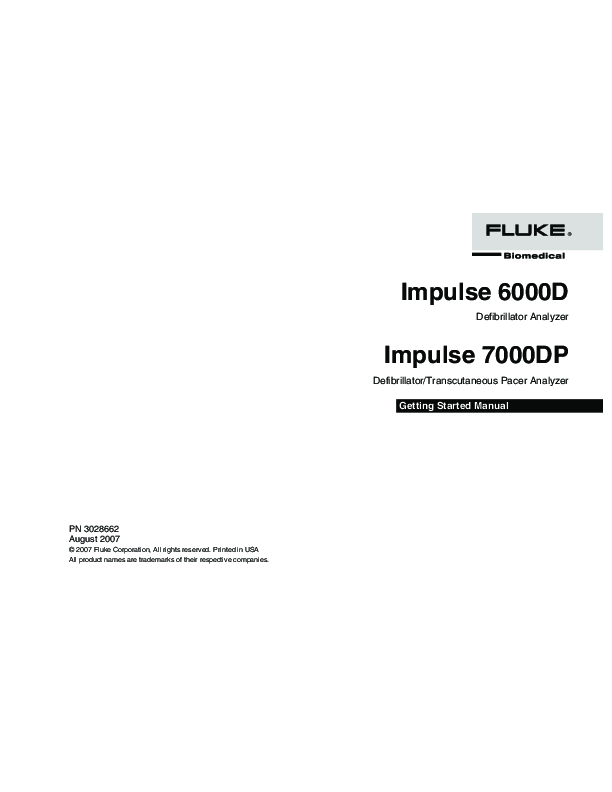 Impulse 7010, Defibrillator Selectable Load Accessory, in conjunction with Impulse 7000, Defibrillator/External Pacer Analyzer, is specifically designed by Fluke Biomedical to allow defibrillator manufactures and end users to comply with portion of IEC 60601-2-4 and AAMI DF80 standards. Impedance in humans has been shown to vary anywhere from 25 to 180 ohms with the average impedance of an adult around 70 to 80 ohms according to an AAMI study. A well designed defibrillation waveform must measure patient impedance and adjust the waveform shape and duration accordingly to optimize waveform performance across the range of anticipated impedance values. The "Section 6.8.3" of the IEC 60601-2-4 standard and AAMI DF80 standard require defibrillators to be tested on different resistant loads of 25, 50, 75, 100, 125, 150, and 175 ohms to ensure proper energy is delivered to patients with different impedances. Impulse 7010 is also the only testing tool to test defibrillators beyond 175 ohms. A 200 ohms option gives manufactures the capability to test defibrillators under extreme impedance conditions. In addition, interface with Fluke Biomedical Ansur, PC-based automation software, allows for standard, streamlined and time-saved operation and total digital data management. Use of Impulse 7010 is easy. Simply connect the Impulse 7010 output connectors to the input connectors of Impulse 7000 as shown in the figure below. The various connection combinations available through the Impulse 7010's rotary switch provide eight different loads for a defibrillator discharge. What is the main difference between monophasic and biphasic waveforms? The basic difference is the direction of current flow between the defibrillation pads. With a monophasic waveform, the current flows in only one direction. With a biphasic waveform, the current flows in one direction, then reverses and flows in the opposite direction. Lower energy is used in biphasic waveforms. What is the purpose of the fan located on the back of the Impulse 6000D/7000DP? The fan on the back of Impulse 6000D/7000DP is controlled by a thermostat IC. The thermostat utilizes an on/off control (i.e., not linear or continuous control). The thermostat IC is located next to the defibrillator load resistor. There are two temperature thresholds. The lower threshold is set at about 40Â° C (104Â° F) and the upper threshold is set at about 50Â° C (122Â° F). When the temperature exceeds the low threshold, the fan turns on. When the temperature exceeds the upper threshold, a warning message is displayed and the unit will not make any further measurements until the temperature has dropped below the upper threshold. Why do I get accurate reading when testing pacer function on the ZOLL M series defibrillator/External Pacer, but inaccurate reading when testing on the ZOLL PD1400 by selecting ZOLL MEDICAL Algorithm from Impulse 7000? ZOLL M Series and PD14000 use different algorithms to output pacing function. The default ZOLL MEDICAL pacer selection in Impulse 7000 uses ZOLL M Series algorithm to detect pacer output from ZOLL pacers. We recommend that customer choose ZOLL MEDICAL brand under Impulse 7000 PACER testing function when testing ZOLL M Series, but choose DEFAULT ALGORITHM when testing ZOLL PD14000 to get accurate readings. Will the battery need to be replaced at some point? Yes. The manufacturer of the NiMH battery cells used in the Impulse 6000D/7000DP specifies a typical loss of 10 % of battery charge after 500 charge-discharge cycles, which is approximately two years of daily use. Battery charge capacity also degrades with time, so even a seldom-used unit will lose some battery charge capacity. The Impulse 6000D/7000DP battery power feature was designed conservatively to maximize the probability of the battery pack performing satisfactorily well beyond two years. Which defibrillation waveforms can Impulse 6000D/7000DP test? Monophasic waveforms used in the legacy defibrillators, biphasic waveforms in most of today's technology, as well as pulsed biphasic waveform, an emerging new technology. How does the Ansur plug-in work? The fan on the back of Impulse 6000D/7000DP is controlled by a thermostat IC. The thermostat utilizes an on/off control (i.e., not linear or continuous control). The thermostat IC is located next to the defibrillator load resistor. There are two temperature thresholds. The lower threshold is set at about 40Â° C (104Â° F) and the upper threshold is set at about 50Â° C (122Â° F). When the temperature exceeds the low threshold, the fan turns on. When the temperature exceeds the upper threshold, a warning message is displayed and the unit will not make any further measurements until the temperature has dropped below the upper threshold.